Veggie patties are my (not so) secret passion. It all started with the incredibly delicious sweet potato patties by Jessica from Howsweeteats. 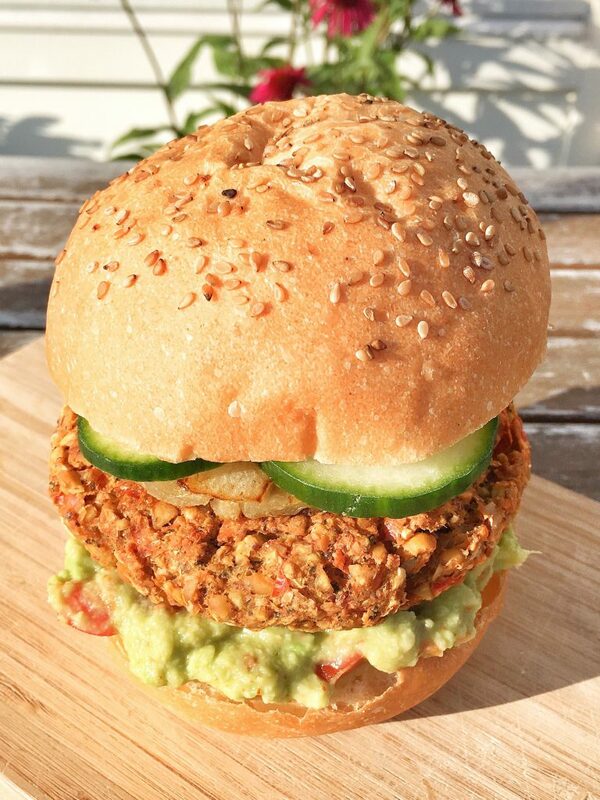 These vegetarian (they contained egg) burger patties showed me 6 years ago (oh my gosh, where has time gone 🙈) that a burger without any meat tastes so much better. In the past, my burgers were literally drowned in ketchup, because I wanted to cover the meaty taste (though I wasn’t really aware of that at the time 🤷‍♀️). Don’t get me wrong, I love ketchup, but today all I need is a blob on my burger, and I’ll devour it with pleasure. In the meantime, I’ve veganized and tweaked Jessica’s recipe a little and they are just as good. I just realized that it’s been a while, since I last had them. 😅 I definetely need to make these awesome patties again soon. These spicy and crunchy chickpea patties are baked in the oven. This doesn’t only save you the annoying frying, but also fat & calories. 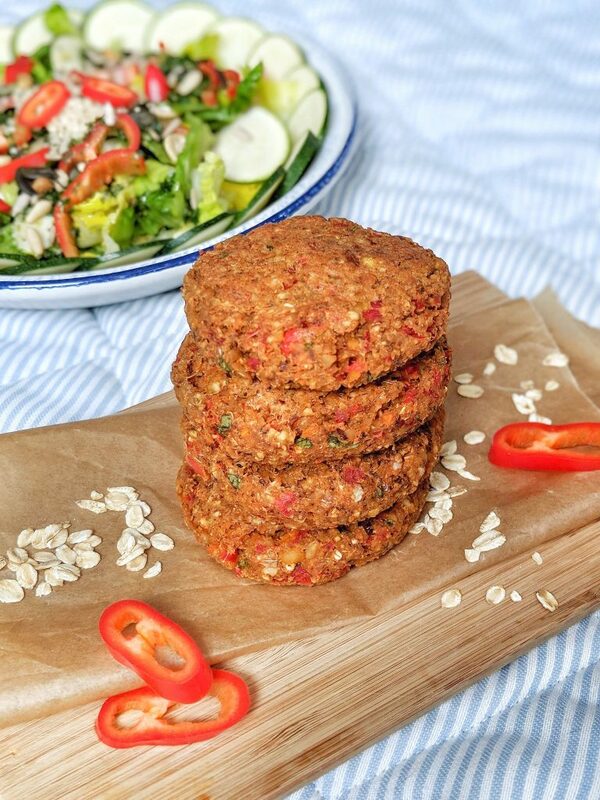 Win win 🙌 The patties are full of healthy vegetables and the chickpeas are a great source of protein and minerals. Carrots and peppers contain lots of vitamins A & C and minerals like potassium, magnesium, zinc & calcium. Chickpeas have about 20g of protein|100 g, 6 mg iron|100 g and their calcium content of 124 mg|100g is about the same as in milk. An all-round healthy balanced pattie, don’t you think? 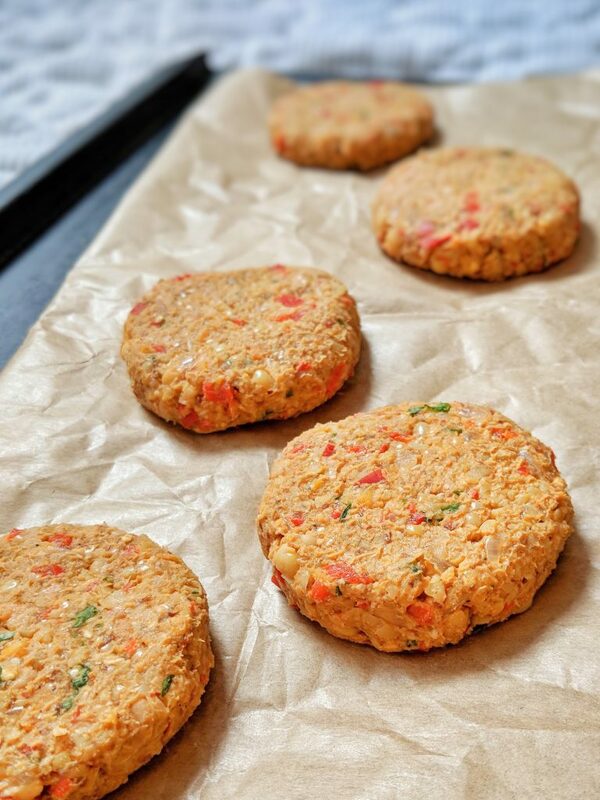 These healthy & hearty chickpea patties are full of good stuff and perfect for veggie burgers or BBQing. They are baked in the oven and are perfectly crispy on the outside without any added oil. Enjoy! Preheat your oven to 190°C|375°F. Put your veggies, onion, garlic and chickpeas into a food processor and pulse until the veggies are finely chopped. You still want some bits and pieces in your patties, so be careful not to let it get too mushy. Transfer the mixture to a big bowl and add the remaining ingredients. Now mix everything through well. I always use my hands and knead it until I’m left with a rather dough-like consistency. (Use disposable gloves for less of a mess 😉). Form 6-8 patties and put them on a parchment-lined baking tray. Bake your patties 20 minutes, carefully flip them, and bake them for 20 minutes more. *You can easily sub this with a flax-egg. **This will give your patties a better binding. Inspired by & adapted from Emilieeats.